Impossibly busy today (yes, connectivist teachers have work to do too!) ... but I am grateful to Matt for carrying on the convo about dual-layer design and instructivist learning: Instructivism vs Connectivism vs Social Learning. His comments and the dual-layer design of #HumanMOOC have been a kind of philosophical catalyst for me, helping me to articulate just why I could not teach in an instructivist environment, and also why I think it is not a good environment to be promoting, especially among higher ed professionals. That first contention is purely personal, but the second one is more programmatic so, with the clock ticking, I am going to use the "5" formula to write up a blog post on this topic before moving on to the day's work: I don't have time to do 10 reasons today, but 5 reasons will be a good start anyway! 1. Instructivism is a highly "school-y" interpretation of learning, driven by the teacher and the institution. Learning, however, must be bigger than school, both formal and informal. Thank goodness children learn to speak through a process of informal connected learning rather than having to depend on school for that! Unfortunately, though, most children learn reading and writing in a disconnected, teacher-driven school environment, and because they do that in a "school-y" way, they often do not even come close to developing their capacities to grow as readers and writers. Why? Because they are put into the artificial environment of instructor-driven learning, rather than student-driven learning that survives and thrives beyond school. I really believe in lifelong learning, and I think the best way to make sure students become lifelong learners is to help them become their own teachers, rather than encouraging them to depend on an institution or an institutional authority figure to organize their learning for them. On that, see this piece by Barbara Fister in IHE just this week: Information Literacy and Recent Graduates: New from PIL. 2. Instructivism obstructs the growth of a learning network. If the teacher is put artificially at the center of the network, that means students are not developing their own expansive learning networks which center on their own needs and expand their own learning pathways. After a class is over, the teacher is gone, and the student is left with... what? If students participate in a network where the center of the network (the teacher) suddenly and completely disappears, that means the network just falls apart at the end of the class. One of the most important goals of education should be, in my opinion, to build a personal learning network that sustains itself, growing and evolving all our lives (and yes, that network is made up of both human agents and other resources, just as Matt says: students need to choose their own books just as much as they need to choose their own co-learners and ad hoc instructors). Instructivism obstructs that process of growth, warping the shape of the student's network for the duration of the teacher-centered class and disrupting the network at the end of the class, so students are ill-prepared after the class is over to keep on learning independently. 3. Connectivism easily encompasses direct instruction; instructivism does not so easily encompass connections. 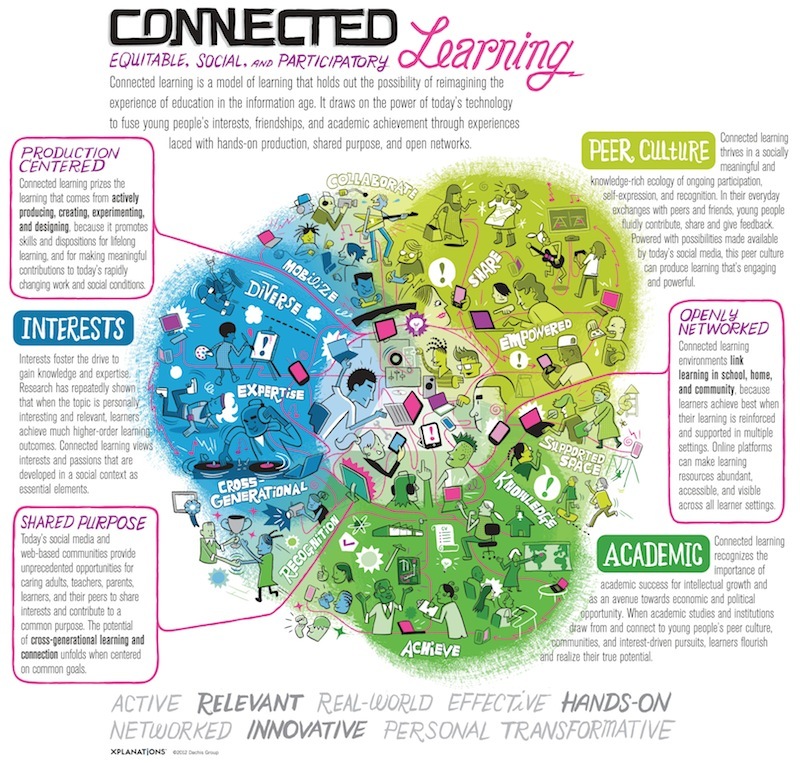 In connected learning, colearning is both natural and expected: we are all teachers, we are all learners. Meanwhile, the instructivist exclusion of colearning was perhaps the most surprising thing for me about the dual-layer approach to HumanMOOC. Matt repeatedly emphasized the need to wall off the instructivist space, protecting it from the outside; that's why a Twitter widget that would bring in the voices from the garden could not be allowed. I was also staggered to learn in the wrap-up that the "wayfinders" (instructors) for the class purposefully shut themselves out of conversations with learners, like Matt saying that he did not participate in the Twitter backchannel for hangouts. Especially in a class like this, where we are all education professionals and colleagues, apparently the force of instructivism was so great as to prevent us from being colearners together, interacting whenever and however we wanted/needed to. I'm glad Maha violated the course design (!) to participate in a hangout with us; we were the richer for her having done so. Does instructivism really mean connections like that between instructors and students as colearners should not happen at all? Ouch. 4. Good learning takes you beyond the comfort zone. One of the most powerful messages for me from Dweck's work on growth mindset is the importance of getting out of the comfort zone, taking risks, experimenting, etc. Matt contends that instructivism represents a real "learning preference" on the part of learners, but is that a real distinction? It seems to me to echo the now discredited "learning styles" rhetoric of years gone by. What I see here instead is something that looks a lot like people wanting to stay inside the comfort zone. People might think they prefer instructivism, but is that just because it has dominated their life in school for years and years (decades for some of us! ), conditioning their behaviors and self-image in pervasive ways? My advice to the students in my classes is this: get out of the comfort zone, take some risks, find a good challenge. It's never too late to de-school yourself. 5. David and Goliath. Finally, it seems to me that we have more than enough instructivism already. Even if I did agree with Matt's contention that instructivism and connectivism are equally worthy models of learning (I don't agree; see above), then the current state of education, which is almost entirely dominated by instructivism, would demand that those of us who care about connectivism do everything we can to promote it, taking every opportunity to show both students and other educators that there IS an alternative to the instructivist juggernaut. Instructivism has an enormous force of tradition and inertia that makes it very difficult to dislodge. Given that I only have limited time, energy, and abilities, I prefer to devote my time, energy, and abilities to promoting the educational underdog here ... and, sad to say, connectivism is very much the underdog even in the year 2016.